I recently did a bride's makeup for her big day and I got a question from one of her sisters about being a makeup artist. She wanted to become a makeup artist and wanted to know how to go about it. I wanted to share with all my lovely readers what it entails since there are many who fantasize about a career in the beauty field, but they don't know where to begin. If you wish to work with a brand name cosmetics company then you should focus on selling. I used to work for A LOT of brand name cosmetic companies and they all cared about the bottom line, which was how much you needed to sell for that month. It was a great place to start since I got hands on various products and I got to test out everything! I also learned techniques from other makeup artists that helped me along the way. It also taught me how the customer should be treated and how they should be cared for! I eventually began to branch out to other types of makeup jobs, including having a contract with one major photography studio in New York as their exclusive makeup artist. I began to work in commercial, film, photography and do bridal work on the side. I also was juggling a job as a regional representative for Benefit Cosmetics where I got to travel all over NY to give demonstrations on brand products and met various people. Becoming a makeup artist is a rewarding career but it is a challenging one as well. Here's a breakdown of how to begin. 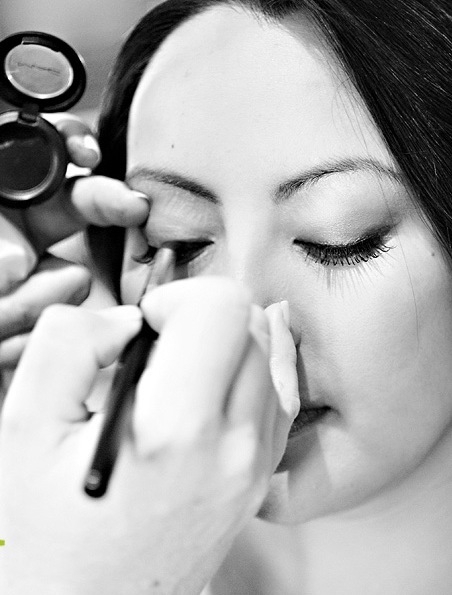 You must first decide what school you wish to attend to become a professional makeup artist. It is possible to be self-taught, but I do recommend at least one course to make sure you are on the right track. Decide where to work. Do you want to work for a specific brand? Or do you want to freelance? Working for a brand guarantees that you get paid every month, while freelancing doesn't. My suggestion is begin from the ground up. Secure yourself financially by working for a company then you can slowly freelance on the side. Once you have frequent clients, begin freelancing full-time. Start a makeup kit. Have essential items in your professional kit for every skin color and type. Be sure you stock up on those essential items once you run out. Get a website. Having internet presence is key in this day and age. It is as important as a business card! Get a card. You still need business cards to pass around at special functions and events. Stay connected. Get linked in, twitter, or any other social service to stay connected with clients and make new ones. Keep photos. Make your own portfolio and share it with clients and other pros. Be confident. It takes a real people's person who has confidence to become a makeup artist. You have to go out there and talk to a lot of people in order to bring in clients. Be on time and prepared. Time is crucial in this line of work, since you might be getting paid by the hour and preparation for anything is essential. Sometimes you might come to do makeup for only two models and end up doing makeup for the entire staff at a fashion shoot. Be prepared for anything. Hope your career in makeup is a rewarding one! Have any other questions? Contact me! Great info. I wanna be one so bad. Good luck!! Have fun with it.